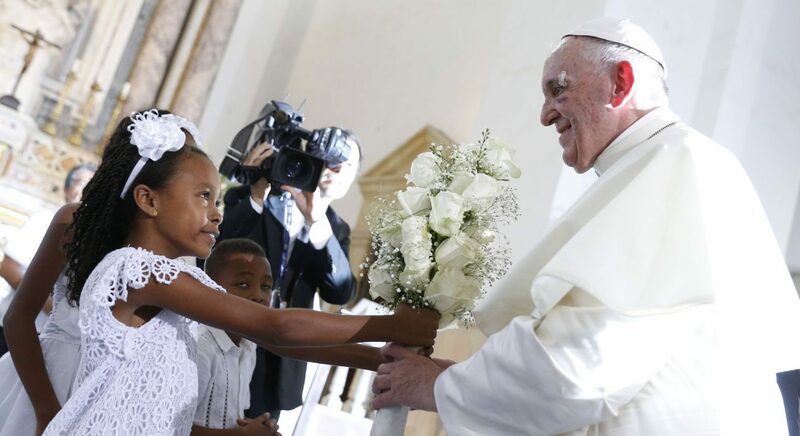 ABOARD THE PAPAL FLIGHT FROM COLOMBIA (CNS) — Politicians who call themselves pro-life must be pro-family and not enact policies that divide families and rob young people of a future, Pope Francis said. Flying from Colombia back to Rome late Sept. 10, Pope Francis was asked about U.S. President Donald Trump’s decision to end the Deferred Action for Childhood Arrivals program, which allowed some 800,000 young people brought to the United States illegally as children to stay in the country, working or going to school. Trump announced Sept. 5 that he was phasing out the program; his decision was strongly criticized by the U.S. Conference of Catholic Bishops. Pope Francis spent only about 35 minutes answering journalists’ questions and commenting on his five-day trip to Colombia. After he had answered eight questions, Greg Burke, director of the Vatican press office, told the pope it was time to sit down because the plane was approaching an area of turbulence. Talking about his five-day stay in Colombia, Pope Francis said he was “really moved by the joy, the tenderness” and the expressiveness of the people. In the end, they are the ones who will determine whether Colombia truly has peace after 52 years of civil war. Politicians and diplomats can do all the right things to negotiate peace deals, he said, but if the nation’s people aren’t on board, peace will not be lasting. In Colombia, he said, the people have a clear desire to live in peace. “What struck me most about the Colombian people,” he said, was watching hundreds, perhaps thousands, of fathers and mothers along the roads he traveled, and they would lift their children high so the pope would see and bless them. By executive order the previous President put DACA into effect, bypassing the US Congress whose job it is to pass laws that the President either approves or vetoes. I don’t think that this should be covered on Catholic Philly. I don’t think that the Pope should be remarking on issues that are not his concern.